18/24 Months - $40.99 Only 1 left! 2T/4T - $40.99 Only 1 left! You know that you've always wanted a wild critter in your home and, well, now that you've got a little tot of your own perhaps we can make it a reality. Nope, check that, of course we can make it a reality! 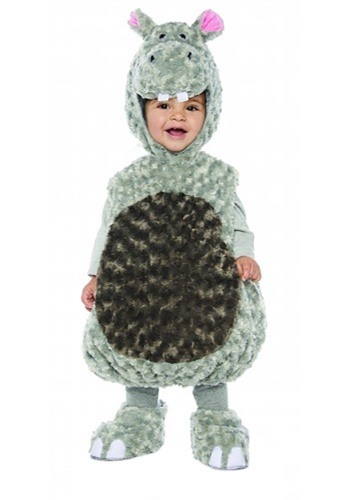 All it's going to take is this hippo costume for toddlers to transform your little boy or girl into a wild beast. Well, maybe a little bit less into a wild critter and more into a hippopotamus of the most adorable and snuggly kind. Yes, that's right, when they're all done up in this adorable tunic costume they're going to look just like a super cute hippo. It's soft, furry, and it even comes with a hippo hood with facial features! One minute you've got a toddler and the next you've got a hippo. Costumes are just way too much fun! This hippo costume comes with a soft furry tunic and features a detailed hippo Hood. And it also comes with coordinating boot covers. Soft polyester faux fur gives it a comfy feel and fun appearance. In sizes for 18/24 months, toddler, and size 4/6, we're sure to have a fit just right for your kiddo. We're sure that having your kiddo dressed up as an adorable hippopotamus will be the highlight of their Halloween fun. And probably yours, too, because you'll get the show off your cute hippo. Get them this costume and let's get ready for hippo fun!